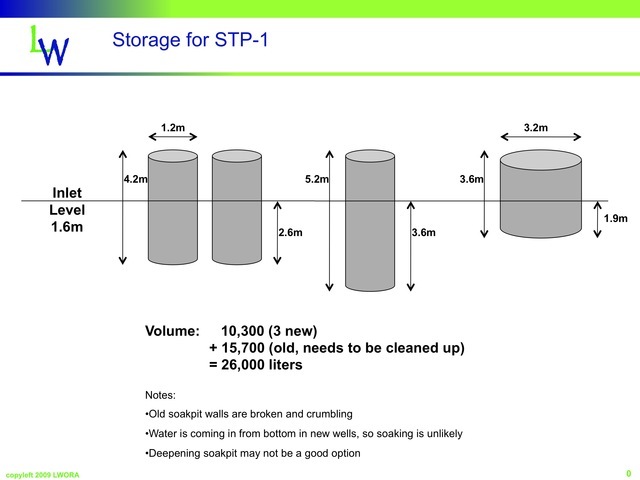 Sewage Treatment Plant #1 (STP-1) was constructed in 2006, but many issues (esp. people issues) prevented it from operating as designed. This project completes the STP with storage wells and a grey water reuse system. Laughing Waters is an urban residential community in the Bangalore suburbs. 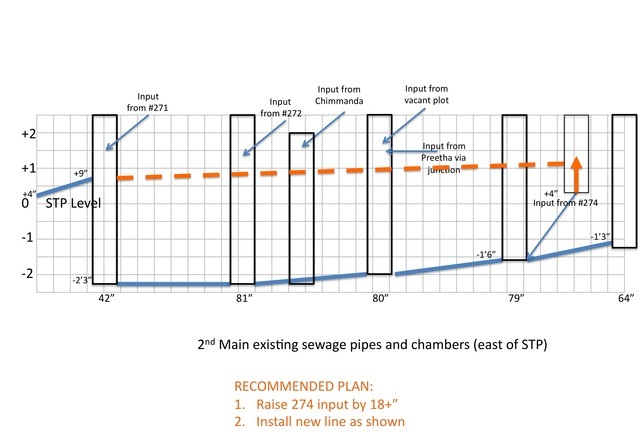 This ambitious plan goes beyond treating sewage water and discharging it (as is done today to the annoyance of the neighbors and some residents). 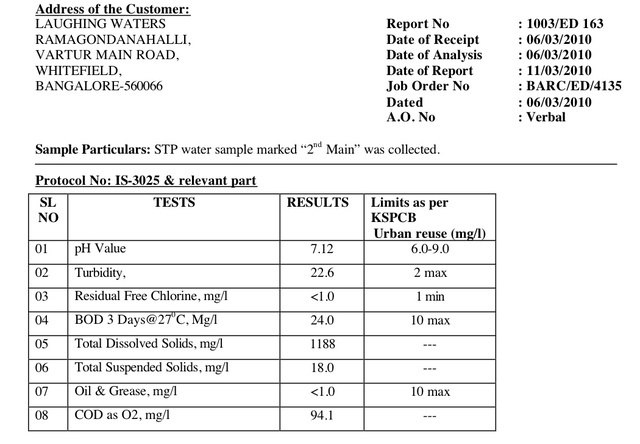 I visited the LW STPs with Rajesh and we noticed that the treated water had a foul odour in the 3 recharge wells. It looks like BOD is not lowered enough for human contact (so can't do irrigation like we do in Lake Shore Homes). We looked at the anaerobic treatment and the water in the recharge wells. My name is Nitin Agarwal and I live in SLS Sunflower Boganhalli Bangalore, It is New New Horizon College. In our society there is rougly 40000 Liters of water is genrated after STP treatment which has to be waisted. The residents of 2nd main know that the sewage line east of the STP actually is lower than the inlet and so has been always containing stagnant stuff. This has led to constant smell and may have been the cause of stench, esp. during rainy. Finally, i got the entire line measured (4 times) and decided to redo it. The design was circulated among the impacted residents of 2nd main and approved. For the past 5 days we have been digging up, and today we have delivery of all the 400+ feet of new pipe. Its going to be an expensive project, much needed, and covered by STP funds. This project will never finish! The line east of the STP down 2nd Main has always been a problem. Most of it is lower than STP and thus has been partially responsible for smell and other issues. 3 measurements of the entire line were taken and a plan to raise the line is attached. The problem is that one of the homes has a low sewage line inlet so it needs to be raised. The plan is to lay the new line on top of the old one and then start blocking the old line and raising the floor of all the existing chambers. The motor burnt out yeserday and the plumber removed it and took it to Whitefield for repair. Rs 1,950 later, the motor is back after the re-winding. The person constructing their home next to the STP is finding a lot of water at the foundation level - coming from the soakpits. So we are running the motor continuously to keep them empty and give the foundation a chance to dry. So the motor may burn out due to overuse. Its hard to find a good quality motor. The next stage to use the water hopefully happens soon. Now, water can be pumped out for resuse. Need a shed to protect motor. And an auto level controller would be a must too. This project can be now marked complete, though small issues will surface constantly. Around 30 banana saplings were planted in a vacant plot about 40 meters away. A temporary pump connection allows 2 hours of pumping operation to empty the soak pits to the vacant plot. A more permanent shed needs to be constructed and a permanent motor needs to be installed. 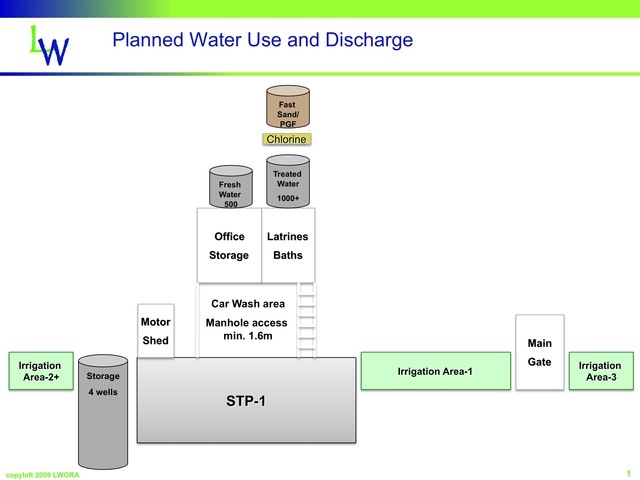 I have drawn up an ambitious plan to reuse the water from the STP by combining the plan of storing the output water, recharging the ground, treating the water, and reusing it with plans of building an office for LWORA and also reducing water consumption for washing cars. Currently the water was being pumped out of the plot and we had one or two complaints. Then we diverted it to the empty plot at the end of the street and the owner complained, thinking it was sewage. On being informed it was not, still complaints. The 3 new storage wells constructed out of concrete rings were put into operation today. Two of the wells are 4.2m (13') deep and since inlet is 1.6m deep, their effective water storage depth is 2.6m. The 3rd well was therefore created to be a little deeper - 5.2m. The total storage capacity of the wells is 10,300 liters. Not quite enough so the original soak pit is going to be cleaned up and also added to storage. A GI pipe (so that the workers on the soakpit do not keep breaking the plastic pipes) was connected to the pump but with so many bends that it is more than the pump can handle. So the motor is being moved closer with a shorter simpler (one round bend) connection.